Jumpstart’s Read for the Record®mobilizes millions of children and adults to celebrate literacy in an effort to break the world record for the most people reading the same book on the same day. 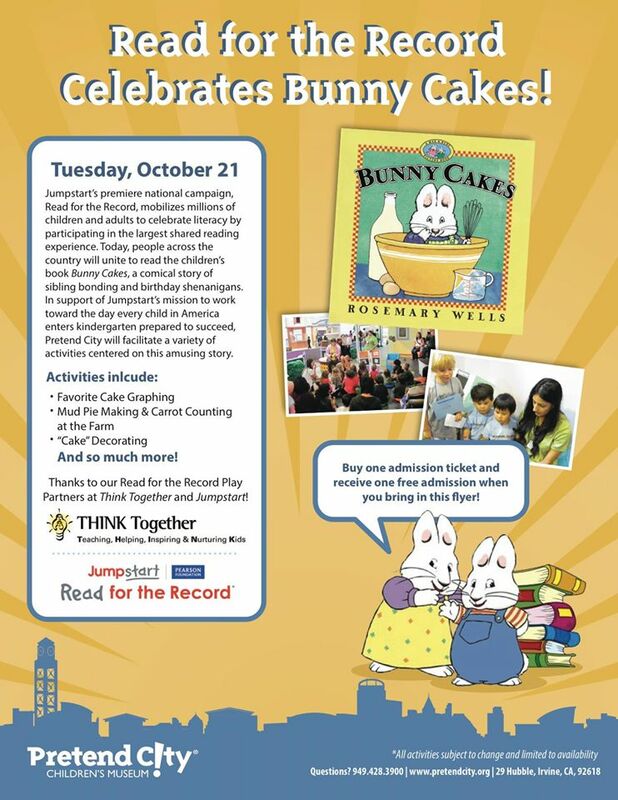 On October 21, 2014, people across the country will unite in big cities, small towns, and everywhere in between to read the children’s book Bunny Cakes, by bestselling author and illustrator, Rosemary Wells. Each year, Read for the Record comes alive thanks to countless reading events in schools, libraries, offices, and homes across the country. We want to help make your reading event the best one yet. On this page you’ll find everything you need to celebrate Read for the Record in your community. In Orange County there will be two special Read for the Record Events. 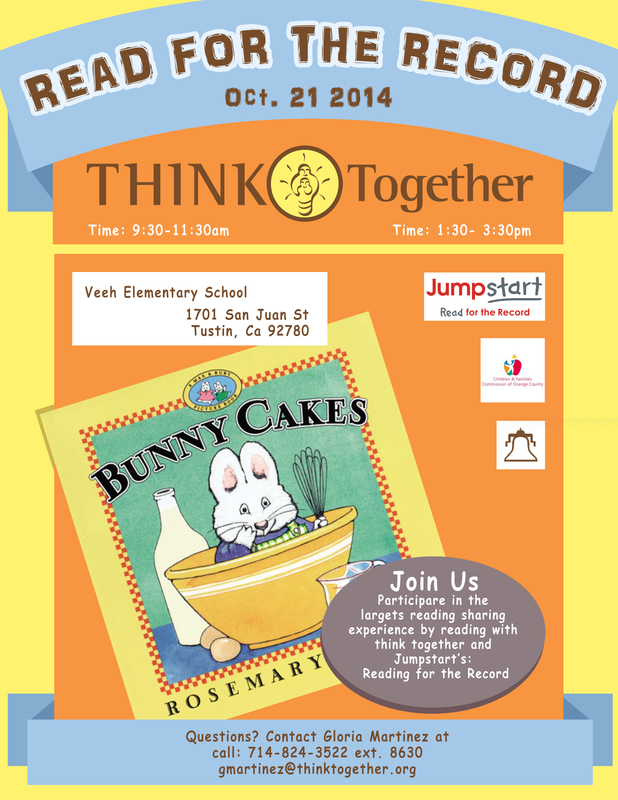 Think Together Early Literacy Program will host events on October 21, 2014 from 9:30 – 11:30 a.m. and another from 1:30 -3:30 p.m. at Veeh Elementary located at 1701 San Juan Street, Tustin, CA 92780. There will be crafts and fun activities to go along with storytime. This event is FREE and open to the public. Pretend City has readings throughout the day on October 21, 2104, this events activities are included with regular admission. Pretend city is located at: 29 Hubble, Irvine, CA 92618. Contact them at 949-428-3900 with any questions. Here’s a coupon for Pretend City’s Read for the Record Event. Just print this flyer and take it along with you for a buy one admission-get one free deal for this event. You can host your own Read for the Record event, Jumpstart’s website has arranged everything you need to break the record! Breaking a world record is a great way to shine a spotlight on the importance of reading and early education, but to help us set a new record you need to pledge to read today. We can’t celebrate the power of reading without books! Purchase Bunny Cakes from the Jumpstart Store. To make your reading event as easy and fun as possible, we’ve put together a variety of resources you can use to celebrate Jumpstart’s Read for the Record. Many of them are customizable to fit the needs of your specific event. There’s a webpage full of ideas, crafts and activities that will take you Beyond the storybook. These activities will keep children engaged and learning long after Bunny Cakes’ timeless story of sibling bonding and birthday shenanigans comes to an end. My Ears: Children will be given a variety of materials to create ears like Max, Ruby, and Grandma. Children will have the opportunity to re-enact the story. Grocery List Collage: Children develop vocabulary and comprehension as they learn to compare grocery items, sort them into categories, and then talk about their collages. 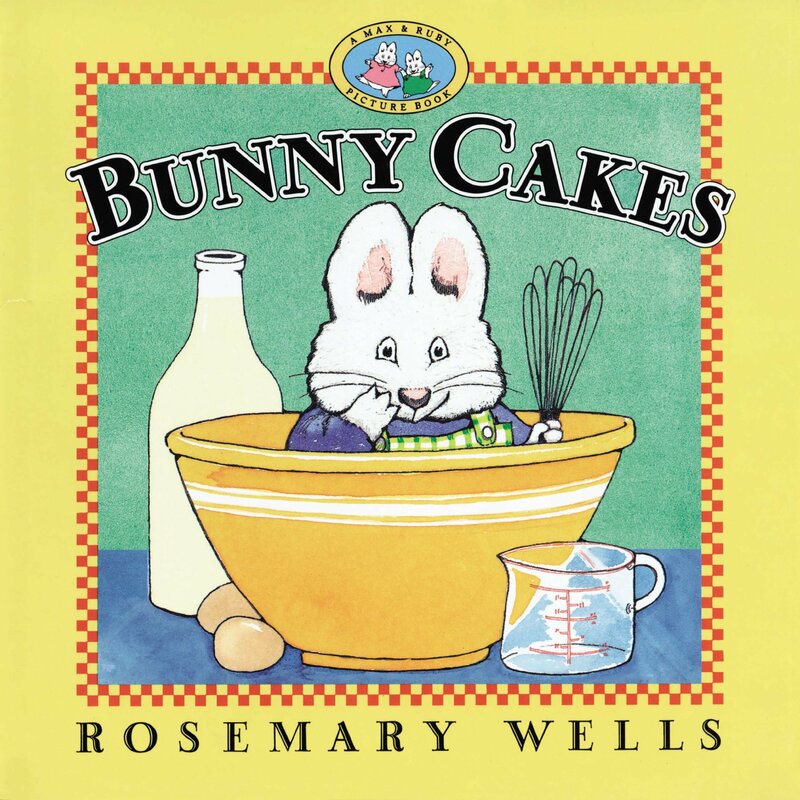 Bunny Cakes Recipe: Children will learn about recipes and the different ways that food can be prepared. Adults work with children to write their very own recipe. Grocery Store: Throughout the story, Max is sent back and forth to the grocery store for a variety of items, such as eggs, milk, and flour. Children can create their own store and practice shopping for items they would like to use. Mis Orejas: Los niños desarrollan vocabulario y comprensión a medida que aprenden sobre las diferentes maneras de crear y usar las orejas. Los niños participan en un pensamiento creativo y la resolución de problemas. Collage De Lista De Compras: Los niños desarrollan vocabulario y lenguaje cuando conversan sobre sus collages y los esfuerzos de Max para hacer la lista de compras usando imágenes y palabras. Los niños participan en un pensamiento creativo. Recetas Bunny Cakes: Los niños desarrollan vocabulario y comprensión a medida que aprenden cómo se puede preparar y cocinar un plato. Los niños también entienden el significado y el uso de la escritura a medida que aprenden sobre escribir y seguir recetas para preparar sus propios platos. Vayamos A La Tienda De Abarrotes: Los niños desarrollan vocabulario y comprensión a medida que simulan ir a la tienda de abarrotes y compran. 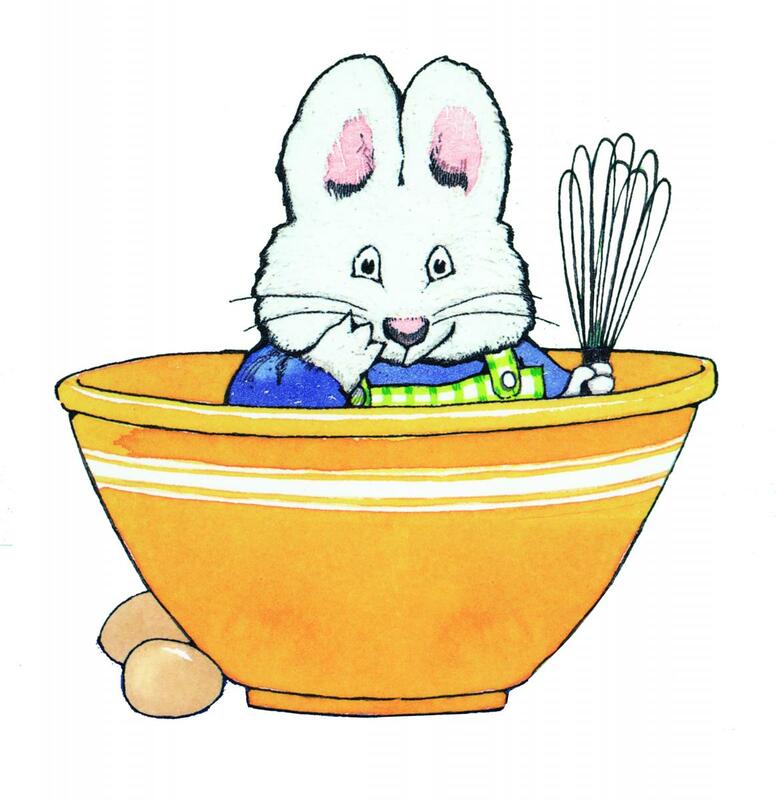 Cake Coloring Page: Max and Ruby are each making cakes to celebrate Grandma’s birthday. Decorate your own cake to celebrate Read for the Record. Max T-Shirt Coloring Page: Max is getting ready for Jumpstart’s Read for the Record. Help him out by designing your own Read for the Record t-shirt.